Airtight House Testing are based in North Wales – Llangollen – but travel for air-testing and MVHR fitting. We are happy to give help and advice in the planning stages and will do early site visits, if wanted, prior to fitting. A house can never be energy efficient without being airtight. During our airtight house testing, we’ll discover air leaks by de-pressurise the inside of your building and using our precision equipment to calculate how much your house leaks. This is now a requirement under UK Building Regs for all new houses which have to meet a standard. Even if you have an old house you are renovating to save energy it is very useful to know how leaky the house is, where the leaks are and if you now need permanent mechanical ventilation. Mechanical Ventilation Heat Recovery (MVHR) systems are a way of recovering heat from air before it leaves your house – most often from bathrooms and kitchens. They only work (economically) in houses that are very airtight: our magic number for installing MVHR is an airtight house testing result of 3 m3/hr per m3. When installed properly in a well sealed and insulated building, though, an MVHR system can help a house ‘heat itself’ with the warmth given off by occupants and appliances. With over 40 years in the building trade I have seen the changes in house building regulations to improve the energy efficiency of the houses and I have watched how badly enforced the regulations can be. Badly fitted insulation, poor attention to sealing windows, a cavalier attitude to air tightness etc. Insulation levels can be specified but if there are gaps in the insulation then you have a bucket with a hole which isn’t really a bucket! 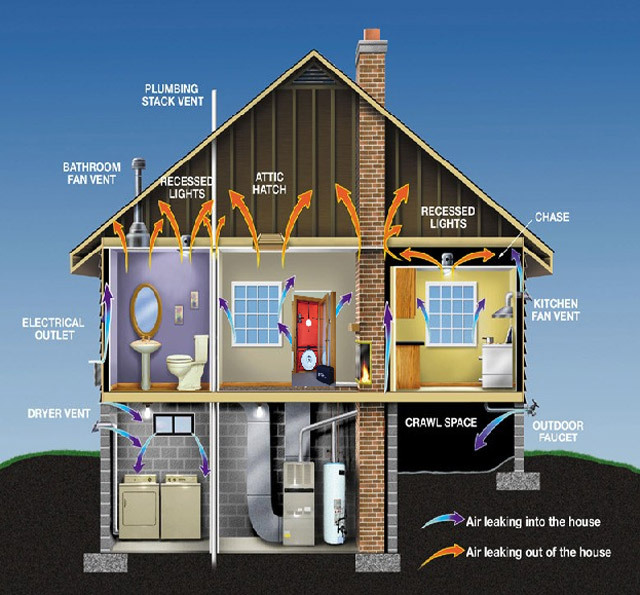 A house can never be energy efficient without being airtight. This is obvious and much harder to achieve than many think. A good project manager who knows about air tightness can save the project money.